Rogue SR-1 Bearing Speed Rope is rated 4.9 out of 5 by 70. Rated 5 out of 5 by Jay S from Love it, but watch where you work Bought this rope in the spring, and was struggling to string 3 consecutive DUs. 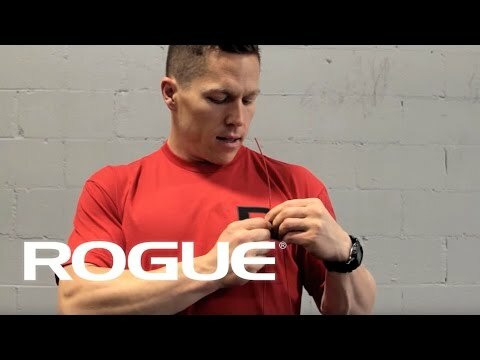 With the help of some videos and tips (in particular, ROGUE athlete Dan Bailey had one where he discussed arm placement and posture), I was up to 10+ quickly. Yesterday, I hit 69 in a row ... before the cable snapped! Remember kids, ROGUE speed ropes are the bomb, but don't use them for months on concrete floors! Love the rope, and a replacement cable is on the way. Highly recommended as a reasonably inexpensive way to improve your DUs. And the red whip lines on your shins and forearms are just badges of honor as you improve your technique. But seriously, use this (or any cable rope) on mats and avoid the sparks! Rated 5 out of 5 by HomeGym GW from Excellent For Double Unders This rope is way, way faster than any other rope I've ever used. In fact when I was first using it I couldn't help but to over rotate my double unders because I was so use to my old rope. The handles are lightweight plastic and will spin for about a minute if just spin them by hand. The rope is actually a thin piece of coated steel cable. Nothing like some welt marks to motivate you from messing up. My only advice is to just trim a little bit off at a time when sizing it. Watch the video but start a little longer than what is recommended because everyone is a little different and you can always just take more off. Rated 4 out of 5 by freakingShane from Worth Every Penny I have used this for around a year or longer and it has been perfect. I used this as my "introduction to jump rope/double unders" rope, and it has always proved me well. Obviously, this is not going to be the best jump rope in the world; however, it's only TWENTY bucks ($20)! This is a great rope to get used to the timing of DUs and will be a solid rope even when you are proficient at them. Even if you decide to upgrade, this will be a solid back-up rope if you need it! Rated 5 out of 5 by HCFJunkie from Solved my DU problem!!! I really regret not getting this rope any sooner. I've had mine for a couple of months now, and honestly, I can say the having the right rope makes ALL the difference when doing DU's. It took me three years - no kidding - to finally be able to get decent DU's, but after buying this rope I reached incredible PR's. I was able to do 8-10 at a time with a lot of effort, and now I can get between 20-30 without killing myself. In fact I was able to get 40 unbroken during a WOD (which is an all-time PR for me). I'm excited to see the numbers go up. This rope is amazing!!! Rated 5 out of 5 by BeastMode from Great Product I started crossfit a month ago and was having troubles with my doubleunders and that's when I decided to try a longer cable rope. I'm 6' 1" and they didn't have jump ropes long enough for me at the box. After I started using the SR-1 Rogue Bearing Speed Rope, it made a huge difference on my doubleunders because the length was perfect. I love my jump rope. Great product. Rated 5 out of 5 by Abhishek from Great for DU's I bought this to learn Double unders. I was struggling to string them for almost 6 months. I made the leap and bought this rope based on the reviews. I went from 0 to 42 DU's in a week. The long handles does aid you to whip the rope. Would update the review after a few months to verify the durability. Rated 5 out of 5 by Brian C from Best Purchase Ever! When I bought this rope over 2 years ago I could barely do 10 double unders... Immediately after using this rope that number jumped to 30. Then the doubles just got easier and easier, and I've used this rope to set pr after pr with my best set to date of 150 unbroken du's. The handles have been stepped on several times and never break, and the rope is over 2 years old and works like new! I like to occasionally hit the bearings with some grease or synthetic oil but I don't think they even need it... Good to know there are spare cables too although as long as you don't use the rope on asphalt it should last a long long time. Rated 5 out of 5 by Jon in NOLA from Good quality I purchased this rope a few weeks back after using a rubber gym rope for over a year at my local cross fit gym. This rope is much nicer! Takes some getting used to, but I can already tell that it is nice. I was disappointed to see on the label that it is Made In China since Rogue brags throughout their site that their products are US based. That is more about Rogue Fitness than the SR-1 rope.